Home / Blog / Plastic Myths Busted! Sorry if we get a bit technical in parts, but we’ll try our best to keep this as jargon free as possible! I can hear you shouting “Surely if it is made of plastic and you can recycle one type, you can recycle anything made from plastic? !” Well in theory yes, in practice not so much. 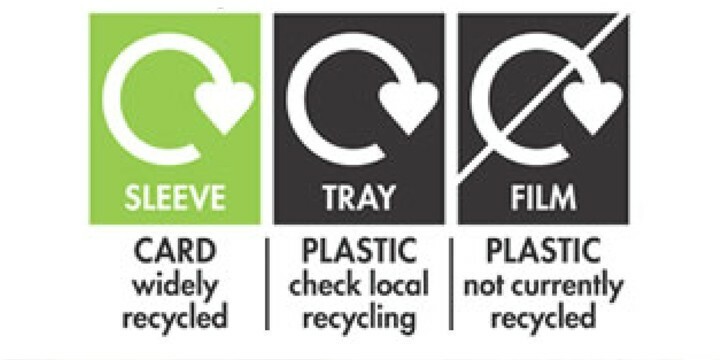 There are 7 grades of plastic and whether you can recycle each grade depends on your local council. It started when clever people in America came up with the Resin Identification Code system to help consumers easily identify the different types of plastic. From now on I’ll refer to them as ‘triangles’, because that’s basically what they are. These triangles contain numbers and this my friends is the key to knowing whether it can be recycled. 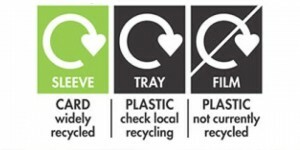 Used in conjunction with information from your local council, which is always easily available online, this makes it easy to work out which plastics are recyclable and which are not. Read on to find out the differences between them…. The most commonly used plastics are those whose triangles contain a number 1 (aka ‘Grade 1’). 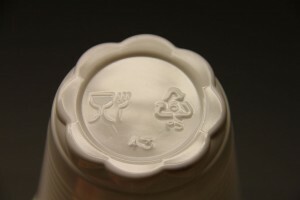 That means it is made with polyethylene terephthalate, commonly known as PETE or PET. This type of plastic is often found in drinks bottles, medicine tubs or peanut butter jars. All type 1 PET bottles can be recycled according to the UK Household Plastics Collection Survey 2014, and almost 60% of PET plastics are being collected for recycling from households. Now 60% may not seem like much but when you hear that just 3% was collected in 2001 you can see how much better we are all getting at recycling! When recycled, PET bottles can be remade back into bottles for soft drinks or transformed completely into carpets, totebags and fibrefill stuffing for coats. Grade 2 plastics are made from high density polyethylene, also known as HDPE. Commonly, these are items such as milk bottles, fruit juice, shampoo and soap bottles and cleaning products. HDPE is 100% recyclable, yet only 79% of these bottles are recycled in the UK (why? You can do so much better!). On average each HDPE milk bottle will contain up to 15% recycled material, although African company Nampak managed to incorporate 30% recycled HDPE into its Infini milk bottle in 2013. Other uses for recycled HDPE include being formed into lumber like bars used in furniture, crates or fencing. On a lighter note, most major soft drinks manufacturers have signed up to the Courtauld Commitment, promising to reduce the carbon impact of packaging, reduction of packaging as a whole and packaging weight. Research is ongoing but since it started there has already been a reduction of 15% in the weight of plastic bottles – great news! Grade 3 plastics are made from Polyvinyl Chloride (PVC). PVC is made into items such as cling wraps, medicine blister packs, garden furniture and plastic pipes. PVC is very rarely recycled and can actually be dangerous if ingested (! ), and when it is recycled it is used for industrial grade items such as flooring. Grade 4 plastics are made from low density polyethylene (LDPE). 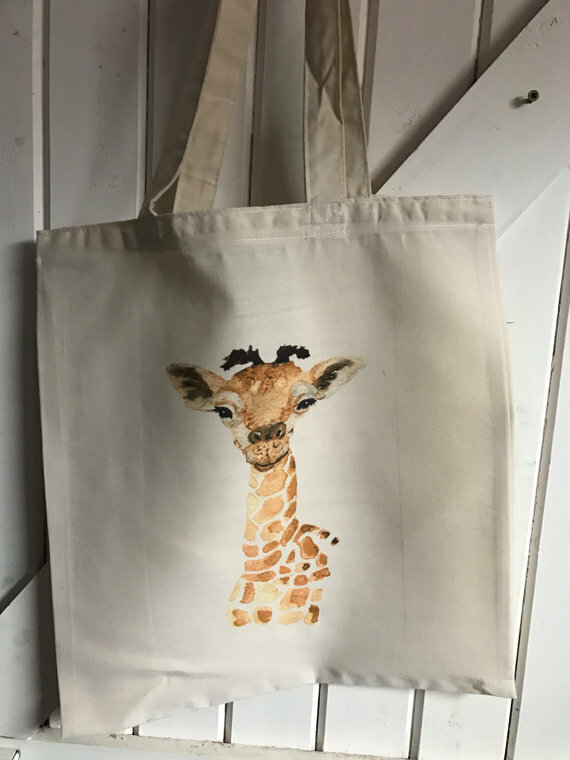 It can be used to make cling wrap, sandwich bags, carrier bags and squeezable bottles. Grade 4 plastics can also be formed into lumber and then built into a variety of objects. Unfortunately grade 4s are rarely recycled although some supermarkets offer recycling facilities for carrier bags (for example here in York Sainsbury’s at Foss Island offer it). Grade 5 plastics are made from Polypropylene (PP). Most common uses include takeaway containers, margarine or yoghurt pots, drinking straws, and medicine bottles. It can be recycled into weirdly-specific items such as ice scrapers, battery cables and rakes. In most areas grade 5 plastics are not currently recycled. Grade 6 plastics are made from Polystyrene. This includes items such as packing peanuts, polystyrene or items branded Styrofoam™. Recycling grade 6 plastics is very costly because it uses a lot of energy, so it is rarely recycled. Where it can be recycled it is usually made into insulation. These plastics are lightweight, buoyant and not commonly recycled; sadly it is the primary component of debris in the oceans. There are more and more alternatives to Type 6 plastics such as biodegradable cutlery and coffee cups or using the types of containers shown below rather than polystyrene. Most of the products made by companies such as Vegware are compostable rather than recyclable but composting is still miles better than contaminating and destroying marine habitats or sitting in landfill forever! A number 7 on plastic items means that it’s a miscellaneous type of plastic that doesn’t fit with the other six codes. This can include polycarbonate and polylactide plastics. These types of plastic are very hard to recycle due to the wide range of chemicals used in their manufacture. Whether or not a type of plastic is recyclable is down to how it is made. Grades 1 and 2 are able to be moulded in a blow moulding process. The other types of plastic (3-7) are made with either an injection or stamp moulding process and involve the use of pesky additives. As they are made from a combination of chemicals it is costly to separate and break down the different components. Another factor that affects the recyclability of plastics is the end market. There is a huge market for for Grades 1 and 2, and it’s stable and well-established. The markets for other grades of plastic are infrequent and inconsistent; this unfortunately makes it easier and cheaper for manufacturers to begin with new plastic rather than collecting enough of the right colour, type, additives, ink etc to use recycled material. When grades 3-7 are left in your kerbside container our St Nicks team will notice and leave it behind – we ask that you remove it before your next collection. If your local authority doesn’t collect these types of plastic it’s really important that you don’t put them into your box! Due to their collection methods the staff won’t know it contains items that can’t be recycled until it’s taken back to the processing facility. At this point it will have taken up unnecessary space on their vehicles and will cost extra money to be separated from the other plastics and disposed of. If the levels of contamination are too high the whole lot can end up in landfill anyway! Just because your box is empty after a collection, it doesn’t mean that it has been recycled. Simply check with your local authority if you aren’t sure! Another thing to note is that manufacturers tend to operate on a national, or even international level. Packaging is standardised to cut costs (imagine having to repackage items based on each local councils’ recycling facilities!) so just because the packaging says an item is recyclable it doesn’t mean it is. Always check before you throw things in your bin or recycling container, you’ll soon get the knack and be able to identify which items belong where. There is however big news in the world of recycling labels: the OPRL (On-Pack Recycling Label) scheme are simplifying information given on packaging so it will show one of three labels. Hopefully it will bring clarity to a confusing and sometimes unneccesarily complex system. Personally I’m unsure. I’ve seen the labels on a few items now and it’s great if the packaging only has one component. When you throw more into the mix – plastic films, inner trays, etc. – this system could fall apart. It could even result in more of the incorrect materials ending up in recycling boxes and being pulled out at reprocessing centres. I hope to be proved wrong! Did you know that 4% of the world’s oil is used in the production of plastic? Or that 37% of plastic in the UK is only used to make packaging? Recycling plastics is great for the environment, but thinking more about the packaging you consume daily and reducing the amount of plastic you get through in the first place is the most important thing to remember. So now you know and are all set to recycle the right items. Where possible, try to re-use, up-cycle and recycle as much as you can to send the bare minimum to landfill. Can I check I’ve got this right? Despite the range of plastics that can be recycled, those of us who’s recycling is collected by York City Council have no way of getting the full range collected? Thank you for sharing the information. This would really help people to understand the waste can be collected and then can be recycled to clean the environment and conserves the natural resources. Hello from Australia and congratulations on your amazing work with recycling and raising community awareness and involvement! It is so inspiring to see so many committed and motivated communities around the world getting on board the #plasticfree and #zerowaste message. York needs to get on top of this. Been here 5 years and just found this out. Why not hire a bunch of people, or at worse eager volunteers, to sort the plastic and take it to Foss Island. I’d rather it not go to landfill. I know I will now be much more careful with what I put in my tubs, I’ve been upcycling soup pots to use for my weekly cooks (store in freezer tastic!) But when I do resort to ready meals, I’ll now store and take to Foss Island on a monthly basis. I’ll probably have very little plastic going to the recycling that I pay for. And you’d think if the council make money out of it, it’d be in their interests to sort it at their end too…there will be too many York residents that won’t learn. Thank you for this article and the clarification. Apologies 🙂 Wasn’t meant to be an attack at you. Far from it. I was meaning in general for everyone. And yes. I am actively buying as little plastic as I can. I don’t buy plastic bottles, I use my local butchers for meat, and I LOVE that Iceland is moving to non-plastic for their own brand stuff. This is really useful. 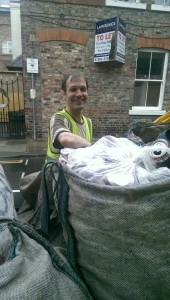 Is there anyway grade 5 can be recycled here in York. I’ve cut a lot if my plastic but kids love their yoghurt and I hate to throw this away. Some grade 5 plastics such as margarine tubs, ice cream tubs & yoghurt pots can be recycled at the bring banks in the car park of Sainsbury’s (both the Monks Cross and Foss Island branches). I’m afraid that only hard plastics such as toys or garden furniture can be recycled at Hazel Court. Yoghurt pots, sweet tubs and the like can be recycled at the bring banks in the carparks of Sainsbury’s (Foss Islands & Monks Cross). Brilliant. Thank you. I’ve just looked at some of my packaging but not all of it has a number on: does that mean it goes in the bin? Can things labelled 1&2 go in the kerbside box? Sometimes the numbers are really hard to find, if it doesn’t and you have the time I would personally try and contact the manufacturer of the product they should be able to tell you. Only plastic bottles can go in the kerbside boxes in York they too have to be labelled with a 1 or 2 but no other 1s or 2s can be recycled in York. I wonder if you can clear something up for me? York website states clearly that they will only take bottles. Can I put labelled 01-rPET food trays (I.e. Fruit trays) for recycling with bottles? Thanks Sam. Are there local rPET recycling facilities? It is fully recyclable and so it seems criminal to add to land fill. Hi Roger, You can take it to the bring banks at Hazel Court or to the bring banks located in the carparks of Sainbury’s at Foss Islands and Monks Cross.